What is the minimum initial deposit required for opening a new account? Do trading conditions for demo account differ from the ones for live trading account? Quotes on demo accounts differ from quotes on real trading accounts. On real trading accounts we have the quotes from more than 10 liquidity providers. Quotes on demo accounts are worse because we are constantly testing new liquidity providers. Also on demo account opened orders influence the spread. I have submitted request for opening a trading account, but I did not receive a confirmation letter. Why? Most likely it happened because of the spam-filter settings that block letters from Forex.ee. To register a trading account please avoid using addresses of free e-mail services. If you still want to use a free service, we recommend using reliable e-mail services like www.gmail.com. Phone Password — any word (combination of words) that is easy for you to remember. If a Forex.ee staff member gives you a phone call, we will ask your name, address and the phone password to verify your identity. Clients can add an unlimited number of trading accounts to the eWallet but can register only one Forex.ee eWallet. Download and install trading platform MetaTrader 4. Launch MT4 and click Cancel in the authorization window. Select menu File → Open an Account. Select NetStock ECN DemoSTP for STP demo account or NetStock ECN – ECN Demoserver for ECN demo account. Click Next. Choose the New demo account option. Fill in the form, switch on the I agree to subscribe to your newsletters and click Next. Save generated login and password and click Finish. Your account has been successfully registered and you can start trading. How to open a real trading account (eWallet)? Click Open Live on the Forex.ee website and fill in the registration form. How to deposit the account? Information about all available deposit options can be found at Payments → Deposits. Log in to your cabinet, select menu Notice about payment, choose your deposit option and fill in the form. If you used Wire Transfer then ask your abnk to provide you a SWIFT (telex)-copy of the payment and send it to [email protected]. This document will help us to find your payment. Can I fund my account using different payment systems? Yes, you can, but we strongly advise to use the same payment method to deposit and to withdraw. If you use multiple deposit methods, you can withdraw the amount you added from each system back to this system. Then you can withdraw the profit into the payment system that was used to make the largest deposit. Deposits: $50.00 Skrill, $40.00 WebMoney, $200.00 Wire Transfer. Withdrawals: $50.00 Skrill, $40.00 WebMoney, $200.00 Wire Transfer. Profit can also be withdrawn by Wire Transfer (deposit via this option was the largest). Yes, please use the Internal Transfer option. The money will be transferred within 24-48 hours. No fee for Internal transfers. Information about all available withdrawal options can be found at Payments → Withdrawals. Note that withdrawal requests made during weekends will be processed on Monday. Funds deposited via a credit/debit card can be withdrawn after 30 days since your last card deposit. Can I trade after making a withdrawal request? We recommend you to stop your trade for 48 hours after the request for withdrawal has been made (while your request is being processed). If you still continue to trade, please, make sure that your free margin exceeds your withdrawal amount. If you have open trades and your withdrawal amount exceeds your free margin at the moment when we check your request, your withdrawal request will be rejected with the comment “Insufficient free margin”. I used several electronic payment systems to fund my account and made profit/took losses. How can I withdraw? If you deposited using several payment systems and made profit/took losses, you can withdraw funds with the payment system used for the largest deposit. Funds deposited via a wire transfer or local deposit must be withdrawn back the bank account. Choose any available withdrawal option. How do I open a trading position? Choose a financial instrument from the Market Watch (at the top-right corner of the screen) and double-click on it. How do I know that a trade is closed? List of open positions is displayed in the Terminal tab at the bottom of MetaTrader window. How do I close a trading position? Go to the Terminal Tab at the bottom of the screen, find the position you want to close in the list and double click on it. Click the Close #… at… button with a unique number and closing price of your position. Open File menu and click New Chart, then choose a financial instrument from the list. How do I change periodicity of a chart? Open menu Charts → Periodicity and choose the time interval you want. What is Balance, Equity, Margin and Free Margin? Balance is the amount of money on your account after the last closed trade. Equity is the sum of Balance and current Profit/Loss of open positions and SWAP. Margin is the amount of money necessary to cover your possible losses during margin trading. Free margin = Equity – Margin. I have downloaded Metatrader 4 from another broker. Can I trade with Forex.ee? Yes, you can. The only thing you will have to do is changing Server name in Metatrader settings: just open Menu Tools → Options → Server and indicate Server name for your account. After that relaunch MetaTrader. I have installed MetaTrader, but it can not connect to your server. Why? If you use your MetaTrader at office, most probably your computer is connected to the Internet via firewall or proxy-server. Go to Tools → Options → Server → Proxy and activate connection via SOCKS4, SOCKS5 or HTTP proxy-servers. In the worst case you will have to ask your system administrator to open port 443 for your computer or set up port mapping for accessing our trading server. Where can I find SWAP values? Right-click in the Market Watch field and choose Symbols in the context menu. Select a currency pair and click Propeties. What are Islamic accounts? Do you provide SWAP-free accounts? Forex.ee provides SWAP-free accounts for Muslim clients. In Islamic accounts, no SWAP fee will be charged or added when your open positions are rolled over the night or weekend. Otherwise, Islamic accounts trading conditions are exactly the same as regular ECN or STP accounts. Traders will be charged an additional commission for overnight positions on STP and ECN Islamic accounts. The commission equals to SWAP. Commission is charged on rollover and is displayed in the Terminal section in MT4. Current SWAPs are available in MT4 in Market Watch → Symbols → Properties. What is the name of Forex.ee Demo accounts Server? What is the name of Forex.ee ECN live accounts Server? How do I install MetaTrader 4? Please indicate installation directory for MetaTrader4 and choose name for Start Menu folder Start → All Programs. We recommend using the default installation settings. Also select a relative check box if you want to Create a desktop shortcut, Оpen MQL5.community website or Launch program after successful installation. Click Next . Linux – is a Unix-like computer operating system assembled under the model of free and open source software development and distribution. Linux systems are widely used in smartphones and server hardware. One of the Linux unique features is the absence of a unified distribution kit. Different groups of developers work on several Linux versions including Debian, Mint, Ubuntu, OpenSUSE, Gentoo, etc. Below there is one of possible methods of installing MetaTrader 4 on a popular distribution kit – Ubuntu. It consists of two steps: 1) installing Wine and 2) installing (opening) MT4 via Wine. *Wine is free software that allows users of the Unix-based systems to run an application developed for the Microsoft Windows systems. Open Ubuntu Software Center and execute “Software Sources” command in the “Edit” menu. To install Wine without using Ubuntu GUI use the command line (which is called “Terminal” in Ubuntu). The system will offer to open the file with Wine. Select this option and click “OK”. MetaTrader 4 installer will be launched. copy the entire folder of the client terminal installed in Microsoft Windows. After copying is complete, you can start using MetaTrader 4 by running its terminal.exe file. Wine will be used automatically to open the file. How to install MetaTrader4 on MAC OS? At the moment installing MetaTrader 4 on Mc OS is possible via a free software application called PlayOnMac. PlayOnMac is a tool to help Mac users to easily install and run numerous applications originally designed to work on Microsoft Windows, via the use of (as a front-end for) Wine. Once you launch the program a window will appear. Click Next; to start the installation preparations and checking your system for all the necessary components. If you already have XQuartz, then click “I’ve downloaded the file by myself“, or if you want to install it later choose “Don’t install XQuartz for the moment“. Click Next. XQuartz is installed in several steps. Before anything else, you should check through the ‘information-to-users’ («Introduction», «Read Me») and accept the license conditions. Confirm the installation by entering your Mac credentials.. Wait for the installation to complete. Click Close. After restarting the system, run PlayOnMac again. The program can offer to install the MS Windows fonts (unless you have them). Please install the fonts if necessary. As soon as the PlayOnMac main window appears, it’s ready for you to use. PLEASE NOTE! When you install PlayOnMac, the latest stable build of Wine is installed automatically. Wine can be updated to the latest (beta) version. To do this, please open the PlayOnMac upper menu and select “Manage Wine Versions”. PlayOnMac creates a separate virtual logical drive for every installed program. Can I use mobile devices for trading? Mobile trading lets you control the situation in the Forex market and your accounts whenever and wherever you are using mobile versions of MetaTrader 4 trading platform for Android, iOS and Windows Mobile devices. With the mobile versions of the trading platform you have full control of your trading accounts, have access to the charts and analytical instruments and can open any type of order. All this delivers you proper trading experience when you don’t have access to your computer. Therefore MT4 mobile has all the necessary features being the important trading tool that allows traders to react to market changes immediately and maximize their profit. System requirements: smartphone or tablet running Android OS 2.1 or later. System requirements: iPhone, iPod touch and iPad running iOS 4.0 or later. Note! When adding or creating accounts search for NetStock servers. What is the name of Forex.ee trading server for mobile platforms? On mobile platforms search for trading server with the NetStock name. How do I install and activate plugin OneClickTradingLevel2? To install OCTL2P you should download setup file to your computer and run it to start the installation. Click Next in the installation dialog box. Before installing OCTL2 we suggest you close all running applications including MT4 terminals. Read the license agreement, select the check box I accept this agreement and click Next to proceed. Before you activate OCTL2 Plugin you need to adjust several properties of MetaTrader4: run MT4, open Menu Tools → Options, go to the Expert Advisors tab and activate the following options: Allow auto trading and Allow DLL imports. Click OK.
To activate the Plugin select Expert Advisors in the Navigator window. The installed advisor should be on the list. Activate OneClickTradingLevel2 Plugin by double-click on in or drag and drop it onto the Chart. In the opened window choose the Common tab, select Allow live trading and Allow DLL imports check boxes and click OK.
Log in to Forex.ee personal area. Choose Partnership > Referral links. You can generate a steady stream of additional income by referring new clients to Forex.ee service. The commissions will be based upon your referrals’ trading activity. Each new client that you refer to Forex.ee must open a Live account using your referral link to access Forex.ee website. Every time your client closes a position (with profit/loss + or – 4 pips or more) in an STP account you will be paid a commission of 2.4 pips. For ECN and Crypto accounts referral fee starts from 15% of the commission charged for the transaction, regardless of the profit or loss.Besides the standard commission described above, you may get an additional commission from your clients as their number grows. For details please read the Terms and conditions of the Referral Partnership Program. Commission will be added automatically to an agent’s account at the end of each trading day for all trades, which a referral has closed during the previous trading day. The incoming commissions will be reflected in the MetaTrader 4, window Terminal, tab Account History and Forex.ee personal area, menu Partnership > Commissions. Where can I see the referral list? The list of all referrals, who registered through your link can be found in Forex.ee personal area Partnership > Referrals. You can place your referral link on your personal website or in a blog, use it a signature on forums, send to your clients through e-mail or Instant Messaging (Skype, Yahoo Messenger, ICQ, etc.) or think of other ways to advertise it. Can I invite a friend of mine to register at Forex.ee as my referral? Yes. But there are some restrictions you should take into account (see 6). Can my neighbors/relatives register their own eWallets as my referrals? No. Any coincidence in Name, Address, Phone number, etc. shall be regarded as attempted churning, i.e. unethical practice employed by some traders to increase their commissions by excessively trading in a client’s account. Will Forex.ee block my accounts if I am caught violating the Partnership program rules? No. The simulated accounts will be removed from the list of your referrals as well as the commission transferred from these accounts to the one of yours. Only the fact you go on violating the rules repeatedly may result in blocking your real and simulated accounts. How much is the partnership commission? To check the commission size please refer to commission page. The agent received a commission from at least 3 referrals in the last 90 days. The amount of partner commission reached the 5 USD limit. What is Forex.ee cashback programm? Forex.ee Cashback Program is aimed at new clients who want to receive additional reimbursement for the first 90 days of trading with Forex.ee (from the date of registration of eWallet). Regardless of whether your trades are profitable or not, you can get real money to your Commission accountwithout having to take any additional action. The Program is completely risk-free. It is especially beneficial for novice traders who trade small volumes. Cashback is a monetary amount that is credited to the Commission account of new Forex.ee clients as a reimbursement from the broker. The amount of cashback depends on the total margin used on the client’s trading accounts in the first 90 days from the date of registration. In Forex.ee Cashback Program, Used Margin is the total margin of all closed positions on the client’s trading accounts in the first 90 days from the date of registration. Cashback Program is valid for 90 days from the date of registration of eWallet. The minimum cashback that Forex.ee can pay you is $5. The maximum cashback per trade can not exceed $100. The maximum total cashback you can get is $1000. The amount of cashback depends on the total margin used on all client’s accounts in the first 90 days of trading with Forex.ee (from the date of registration). Standard commission–percentage of the Forex.ee commission–is the base value used in calculating the cashback and partner commission. It equals 2.4 pips (5-decimal pricing) per trade in an STP account and 15% of Forex.ee commission for a trade performed in an ECN or a Crypto account. Standard Commission is multiplied by a certain coefficient, which depends on the total Used Margin on all client’s accounts. You can find coefficients for cashback calculation in the table below. 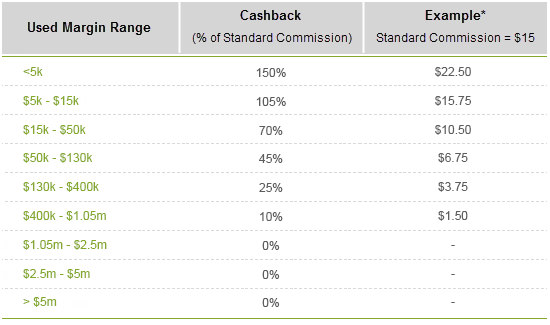 The right part of the table shows an example of calculating the cashback if Standard Commission is $ 15. The chart illustrates the example of cashback calculation given in the table. As you can see, cashback value decreases with the increase in the total Used Margin. Nashback is not credited if during the first 90 days of trading with Forex.ee the total Used Margin exceeded the threshold of $1.05m. Conversely, novice traders can receive the maximum cashback. In our example, a cashback of $22.50 will be credited to the client’s account if the margin used in the first 90 days was less than $5k. In this case, the Standard Commission is multiplied by a maximum coefficient of 1.5 (150%). The total ECN Commission paid from all trader’s accounts in the first 90 days of trading with Forex.ee is $100.00. The Standard Commission is 15% of ECN Commission. The total margin used on all trader’s accounts in the first 90 days of trading is $45k. We have: the Standard Commission is $15.00, the total Used Margin is $45k, which is in the range from $15k to $50k. Cashback coefficient in this range is 0.7 (70%). The amount of cashback is: $15.00 * 0.7 = $10.50. The client gets a cashback in the amount of $10.50 as a reimbursement from from the broker for the first 90 days of trading. If you use your MetaTrader at oﬃce, most probably your computer is connected to the Internet via ﬁrewall or proxy-server. In this case try to change Proxy settings in MetaTrader. Go to “Tools – Options – Server – Proxy” and activate connection via SOCKS4, SOCKS5 or HTTP proxy-servers. In the worst case you will have to ask your system administrator to open port 443 for your computer or set up port mapping for accessing our trading server. Do trading conditions for demo account diﬀer from the ones for live trading account? Which currency should I choose to deposit funds to my account? How long will it take me to receive funds from my trading account? I can’t log in to Forex.ee personal area. Password – Forex.ee password. (Сase sensitive! Please, keep the lowercase and uppercase letters). Note! If this data is correct, most likely, you have set an IP-filter in Forex.ee when you logged in there last time. The IP-filter allows to log in only from one and the same IP-address. That’s a good security measure if you have a static IP-address. But if your IP-address is dynamic (or you are not sure about your IP-address type), please, DO NOT type your IP address into the IP-filter section! To switch off the IP-filter, please, e-mail a request to [email protected] or contact our Live Chat. Log in to your Forex.ee personal area with your e-mail and Forex.ee password. Select Profile → Change Password in the main menu. Fill in the form and click Save. Your eWallet Password will be changed just after you click the Save button. I’ve got new password but I can’t log in to the my Forex.ee with it. Please email to [email protected] by using the same e-mail that of the account. I forgot my e-mail and can’t log in to My Forex.ee. How can I recover it? Click Forgot your password or login? in the login window. Choose eWallet e-mail from the Recovery for drop-down list. If you do not remember your Forex.ee eWallet number (eWallet), you may enter number of any of your trading account attached to your eWallet! Click File → Browse in the National ID field and choose your scan of the relative document on your computer (See document scan requirements). Note! Make sure you indicated your phone number correctly. Probably Forex.ee Support Service will need to contact you on the phone to confirm the Recovery process. Your Recovery request will be processed within 48 hours. I forgot my password for eWallet and can’t log in to My Forex.ee. How can I recover it? Choose eWallet password in the Recovery for drop-down list. Enter you e-mail address registered with the Forex.ee eWallet. Click the confirmation link in the e-mail you will receive in a few seconds. Find a new password for your eWallet in the e-mail you will receive next. I forgot my Phone Password or Master (Trader) Password. What should I do? Log in to your My Forex.ee. Select Profile → Recovery in the Main Menu. Choose your trading account you want to recover information for from the Account Number drop-down list. Select the recover action from the Recovery for drop-down list (Master (Trader) Password or Phone Password). Click File → Browse in the Proof of Address field and choose your scan of the relative document on your computer (See document scan requirements). You Recovery Request will be processed within 48 hours.